Juicy World is an addictive juicy block blasting game from Joymax. 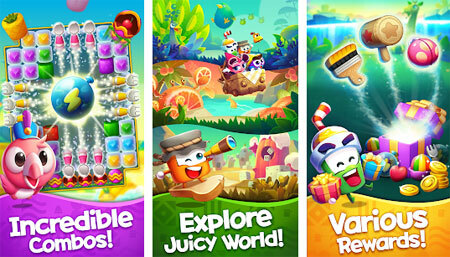 Discover Juicy World and use your fruit bursting skills to help Judy, Bellody, and the gang to blast fruit away. Tap and blast blocks and use cool boosts, amazing power ups, and solve complex puzzles. Match two fruity cubes to create powerful combos and beat the level. The levels progressively become more challenging, so get ready to test your problem solving abilities as you embark on a colorful adventure in Juicy World. If you get stuck in the game, check out the video walkthrough and gameplay for the game. This entry was posted in Android Games, iOS Games, Mobile Games, Walkthrough and tagged Juicy World Cheats, Juicy World Gameplay, Juicy World Guide, Juicy World Strategy, Juicy World Walkthrough by Marvin. Bookmark the permalink.